Photographs showing how children's fashions have changed since Victorian times has inspired a new exhibition. 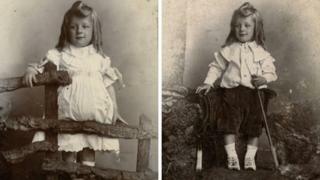 Sepia images taken in 1898 of a boy called Clifford Jobbins show him before and after he was "breeched". It was a rite of passage for Victorian boys in which they stopped wearing dresses and wore their first pair of trousers. The snaps inspired the Abbey Museum's youth club to make the clothing exhibition called He, She, They? It raided Leeds Museums' archives to chart the evolution of children's clothes from Victorian Britain to the modern age. Angela Thompson, the museum's youth engagement officer, said: "The hair was worn long and then would be cut after he was breeched. "The boy would be presented first in a play dress and then in trousers, about the age of six. "Girls were not breeched, but their age was denoted by their hemline - the older the girl the longer the dress she wore." Ms Thompson also said that during the Victorian era, girls often wore blue and boys pink and that it was not until the late 1940s or 1950s the colours started to swap. "Pink was thought of as a stronger colour as it was derived from red," she explained. Since Victorian times children were often dressed as mini-adults - something that lasted until the late 1970s. Ms Thompson said a big change occurred during the 1980s, when women began to earn money and there was more disposable income to spend on children's clothes. Up until the 1970s knitted garments often played a big part in a child's wardrobe but consumerism and clothes bought from retailers and latterly supermarkets meant they became unfashionable. Ms Thompson said the current "fast fashion" market means children's clothes are easily available and relatively cheap. "The recent crafting movement is beginning to make homemade clothes cooler," she said. "We will see more vegan-friendly clothes and others made from recycled materials." He, She, They? The Changing Face of Children's Fashion, runs at Abbey House Museum until January 2020.